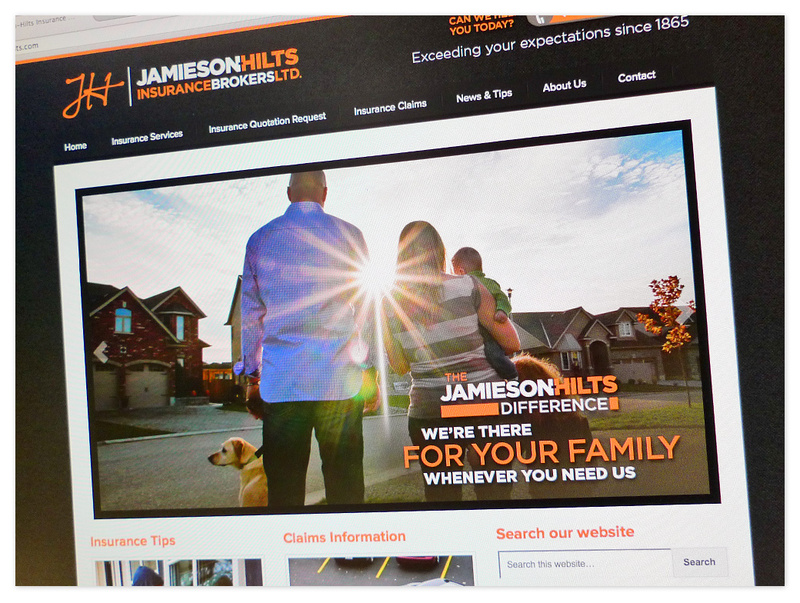 Jamieson-Hilts Insurance Brokers of Woodstock, Ontario were looking to update their aging identity including a complete overhaul of all their collateral, ads, storefront and website. 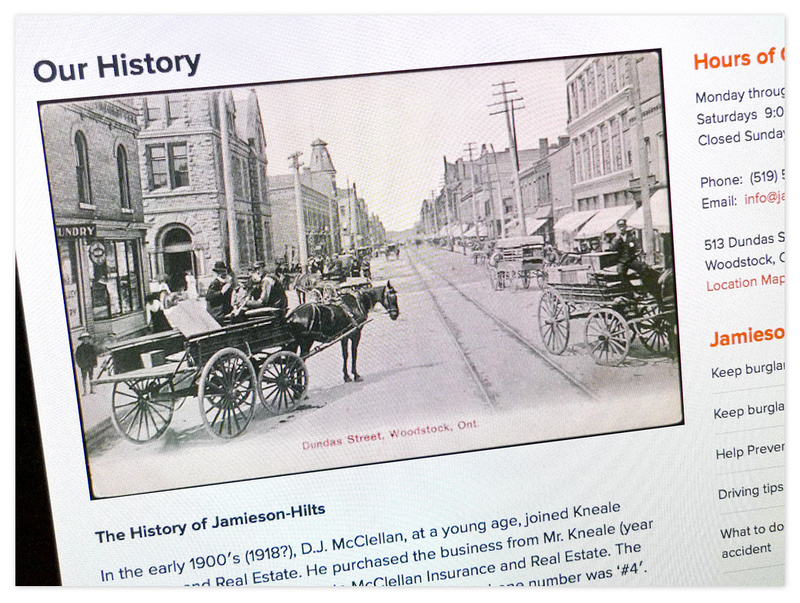 Jamieson-Hilts is a well respected company with it’s roots going all the way back to 1865. The operation has always been a family business with the current owners taking over from their parents a few years ago. They are forward thinkers and took the opportunity to do evaluate current and future opportunities. The company has been around for a long time and their goal is to change with the times and keep the company current and relevant to today’s consumers. 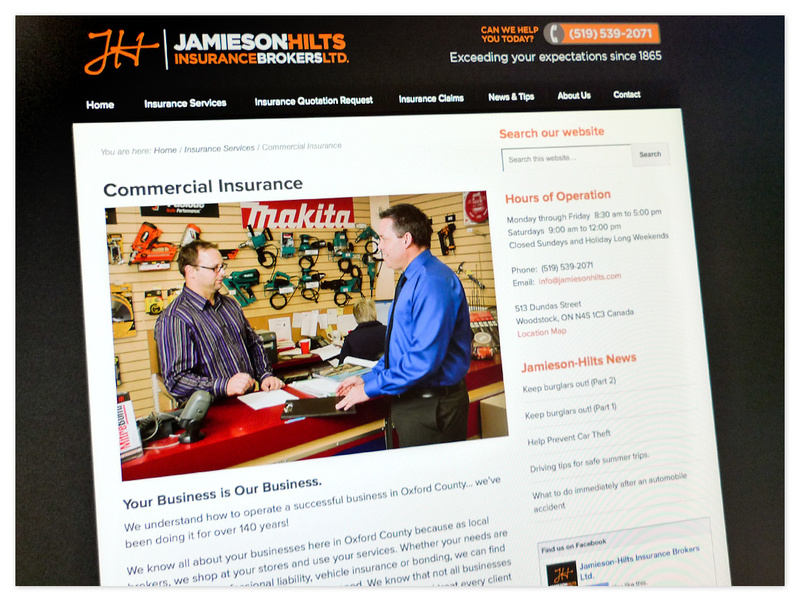 The Jamieson-Hilts Insurance website works great on desktop and mobile devices; prospective and existing clients can get the information they’re looking for whenever and wherever they are. Their old website was in need of replacing; it didn’t work in the mobile environment and wasn’t easy to update, and thus the content went stale. They wanted to easily and quickly update the website, share insurance tips and relevant information, and then get that out to their people via social channels like Facebook and Google+. Their website needs were simple compared to many of the projects I’ve worked on, but they wanted it be consistent with their bold new look. Commercial Insurance is a large part of their business, so they wanted to ensure their modern look would also be strong enough to stand up to the larger, corporate insurance brokers in the competitive Southern Ontario market. 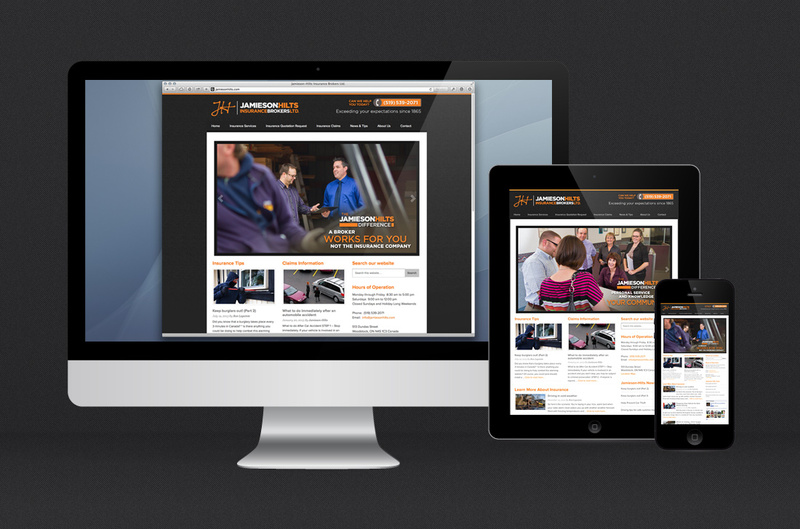 You can view the Jamieson-Hilts Insurance Brokers website here. Get insurance information from the Jamieson-Hilts website wherever you are. 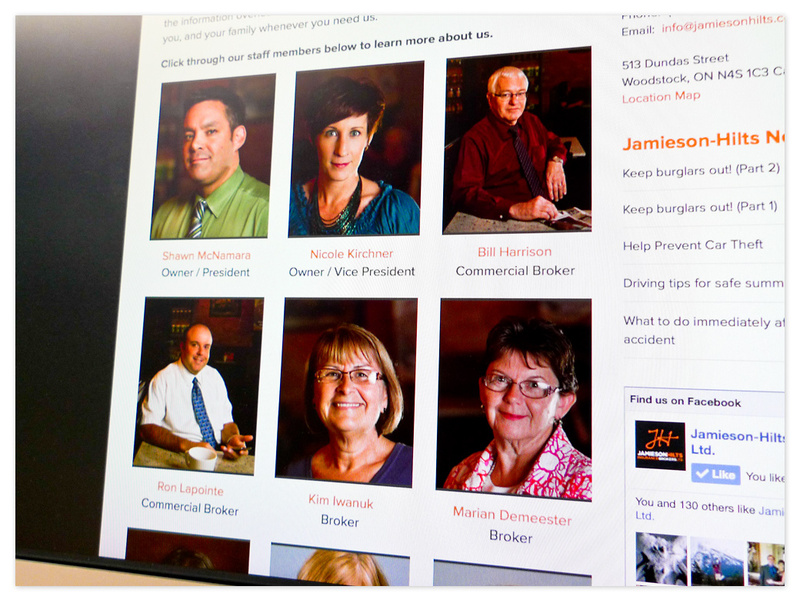 Custom photography of the owners and staff was shot to highlight the people who make Jamison-Hilts stand out – the people you see on the website are the people you’ll work with at their office. 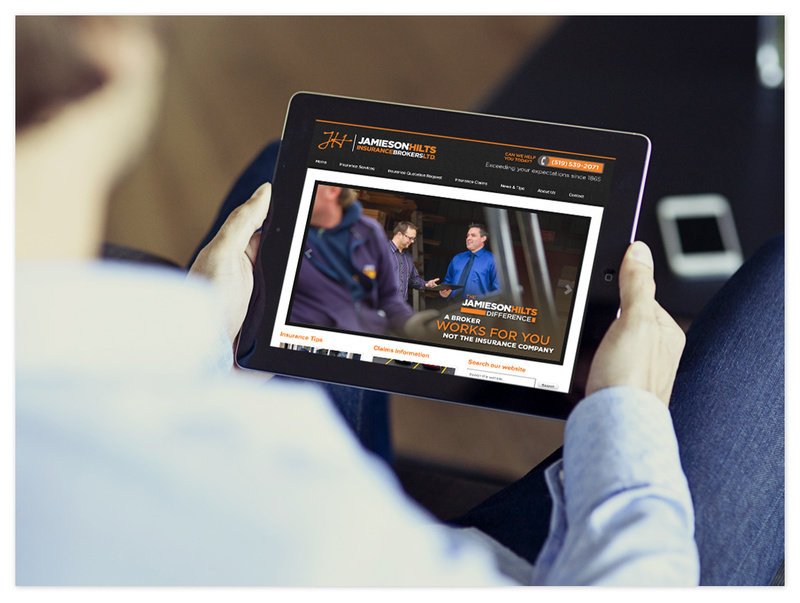 Personalized customer service is paramount in everything Jamieson-Hilts does. Working with a digital strategist and writer to help their marketing team with content creation, multiple tips and information pages were put together to make sure the content was in place so that I could help style it to fit the website. The website includes application forms to get your insurance needs reviewed prior to sitting down and meeting with your service representative. 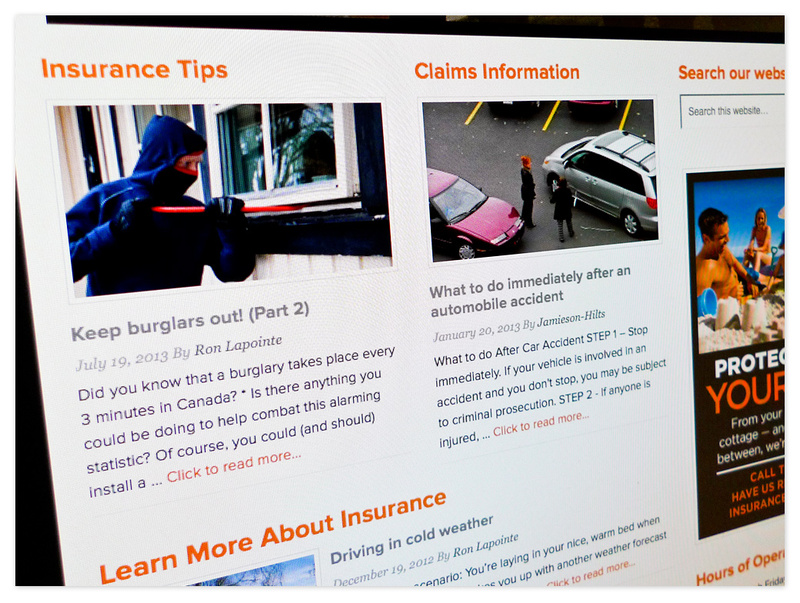 Insurance Tips and Claims Information appear on the front page of the website. 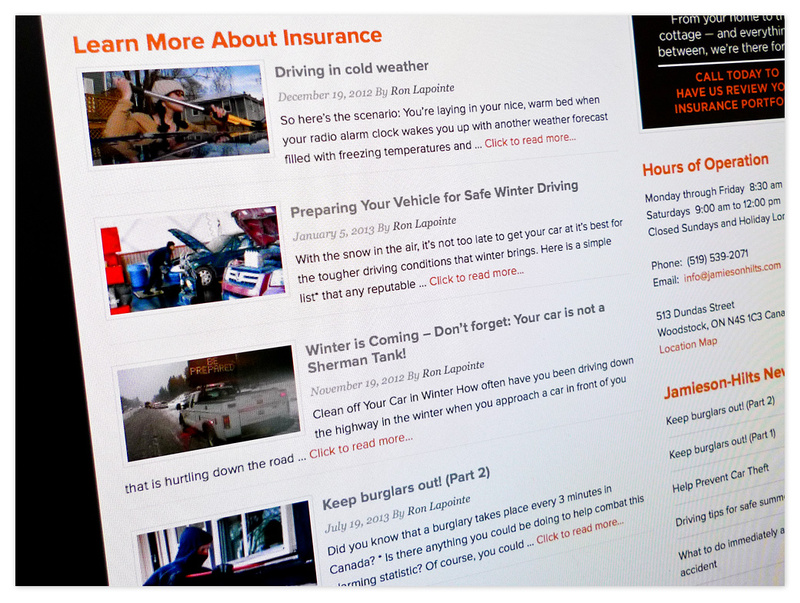 Tips and news about insurance products and services also appear on the front page – no shortage of information to pass along to customers looking for more information and tips. Shawn, (in blue) one of the owners of Jamieson-Hilts Insurance speaks with a long-time commercial client at his business. Custom photography took place at a local coffee shop to capture all the employees. Personalized customer service is paramount in everything Jamieson-Hilts does. 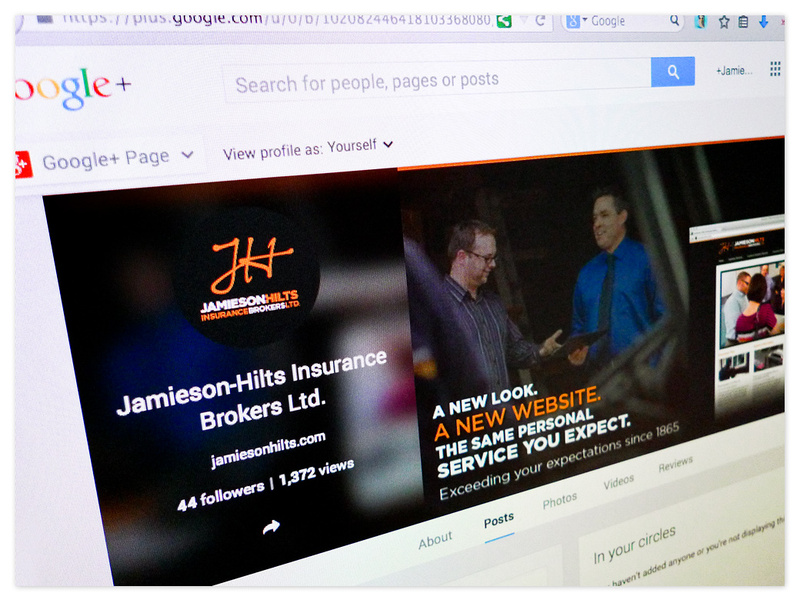 Jamieson-Hilts presence on Google+ announces the new look and website. A sidebar ad on the website links you through to home insurance information. 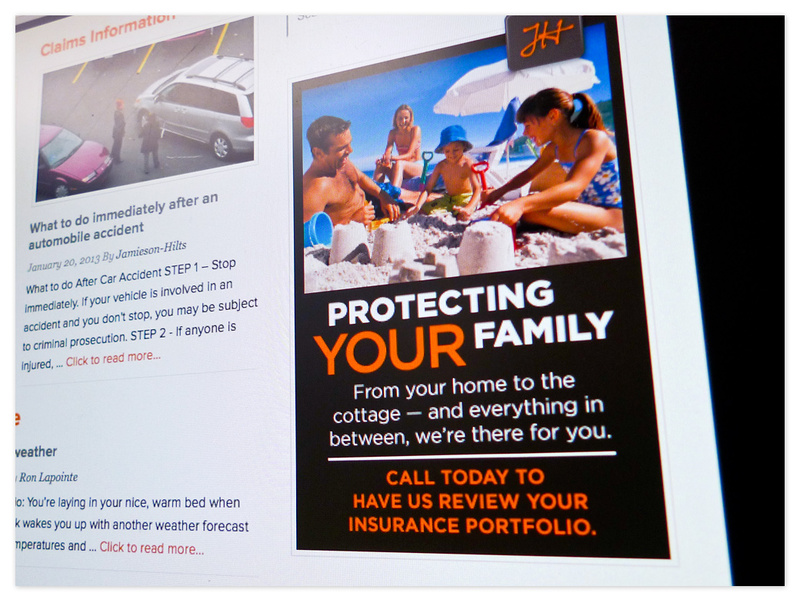 These ads will rotate with the seasons to bring relevant information to the foreground. Facebook integration via the sidebar widget connects both potential new customers as well as existing ones — sharing smaller digestible tips via the Facebook page. 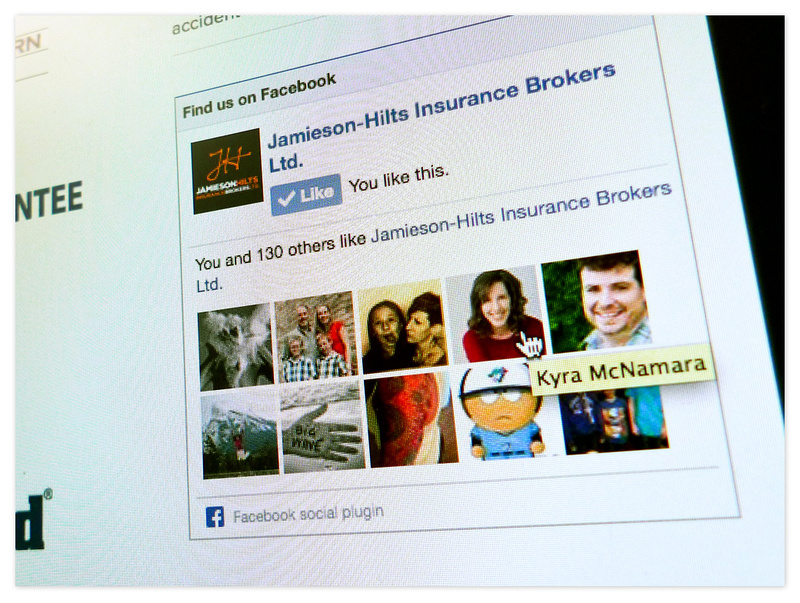 See also the Jamieson-Hilts Insurance Identity.